This mod provides a number of different ways to enhance the vanilla experience of Minecraft and provide easier or alternative ways to obtaining materials or blocks. This is to allow you to focus on what you really want to do, BUILD! Now where did I put that bed? When you use this item, it will tell you where your bed is in relation to your current position. This only works in the overworld and if you have slept in a bed. Note: It will still tell you your last bed location even if your bed was destroyed or is no longer accessible. Different ways of getting enchantment books! Fluffy Fabric - This item allows you to create the enchantment book for Silk Touch or to enchant your boots with the Step Assist Enchantment. Snorkel - This item allows you to create an enchantment book with the Respiration 1 enchantment. Whetstone - Allows you to create an enchantment book with the Sharpness 1 enchantment. When you don't want to use iron to shear some sheep or clip some grass. Like normal shears but less durable. These swords are really really fast, so fast you would think you were playing before there was a cool-down! For the wood swift blade, you can use any kind of wood. Just like a normal sword. A sickle is a new tool which is used to cut down grass, flowers and leaves in a wide area with a single swing. Sickles will not cut down crops. Note: For the wood sickle recipe, you can use any type of wood plank. A Lump of Iron is created when you squish 3 Iron Nuggets together. Using Iron Lumps, you can create Chainmail armor. 3 Iron Lumps can be squished together to make an iron ingot. 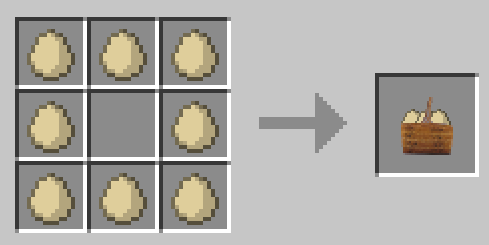 There is also a reversal recipe to turn an Iron lump back into nuggets. Iron Lump Crafting is below followed by the recipes for Chainmail armor. As an alternative to books, you can make scrolls. They are enchantable from an enchantment table and can be attached to items through the anvil just like enchanted books. You can even make bookshelves with scrolls. The recipe can include any kind of wood. Note: Some enchantments may be unavailable due to how other mods interact with enchanted books. Right-click when in off-hand and not pointed to any block to open the inventory of the bag. Shows the currently selected item when placed in the off hand and what is the current slot number. Right-click when in off-hand and pointed at a block within range to place the currently selected item (if it can be placed in the world). Use Alt + X, Alt + Z to change the currently selected item. These keybinds can be changed in the normal keybind menu. Sneak and right-click when the bag is in your off-hand to open/close the bag. When the bag is open it will automatically harvest block/monster drops and place it in the bag instead of your normal inventory! Bunches and crates are a way to store large amounts of foodstuffs. There are currently 4 varieties of storage. The first tier is a "bunch" or "clutch" (for eggs) of the associated food. This is created by placing 8 of the food in a circle in a crafting table. Of course there are reversal recipes for all of this. 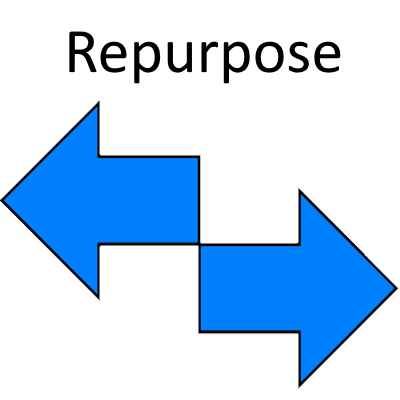 For pictures of the reversal recipes, check out the images tab. The second tier is a "Crate" or "Carton"(for eggs) of the associated food. You typically create these by surrounding an empty crate with a bunch/clutch. Eggs are unique here since you want to put some paper between the egg bunches so they don't break! Turns redstone power on and off in configurable directions and length of time! This block will turn on and off periodically. If you right-click on the block you can configure how long it stays on and off. You can even specify which sides of the block send out power. Some dirt slabs to keep the monsters at bay. When placed this block can turn into a Grass Slab if there are other grass blocks near by. Some dirt stairs for when you don't have enough stone. When placed this block can turn into a Grass Stair if there are other grass blocks near by. A dirt wall that won't crumble! When placed this block can turn into a Grass Wall if there are other grass blocks near by. Dirt stairs with a nice layer of grass for your tired feet. A nice dirt wall with some grass on top. What do you want to grow? This can grow anything! This block can grow any vanilla crop including things like Nether Wart and Sugar Cane. Trigger traps (or open mundane doors) when players, monsters or animals are near! This block can scan in a radius around it to detect entities and generate a redstone signal if it finds one. This block can look for Animals, Non-Players (Villagers), Monsters and Players. The size of the scanning radius can be configured and the sides which are scanned can be configured. When you need a little bit of redstone power. Same glowy power as regular glowstone but for half the size! Right-click on any fully grown crop to harvest the results and re-plant the seeds if any seeds would have dropped or if you have some in your inventory. 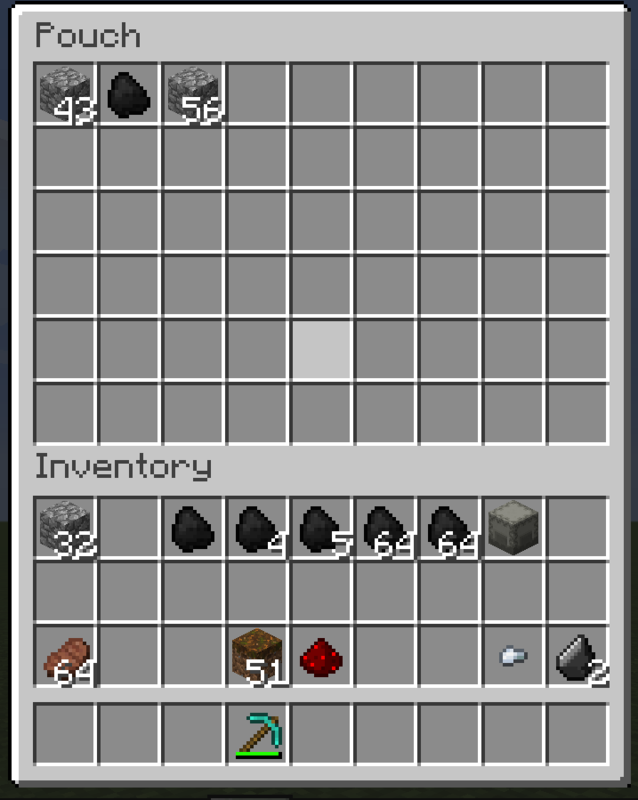 Coal ore has a chance to drop Diamond Shards when broken. 4 Diamond Shards can be crafted into a Diamond. When you break a any kind of leaf block (without shears) there is a chance for it to drop a stick and/or an apple. The following new recipes are included. Smelt any undamaged vanilla armor back into their crafted ingredients. The following are associated with the Wood Recipes configuration setting. Wood slabs (must be same type) in 2x2 square goes to 4 sticks. 2 Wood slabs (must be same type) can be turned back into 1 plank. 2 Wood stairs (must be same type) can be turned back into 3 planks. The following are associated with the Stone Recipes configuration setting. 2 Stone stairs can be turned into 3 blocks. 2 Stone slabs can be turned into 1 block. The following are associated with the Misc Recipes configuration setting. Smelt rotten flesh to leather. This recipe has it's own configuration setting. 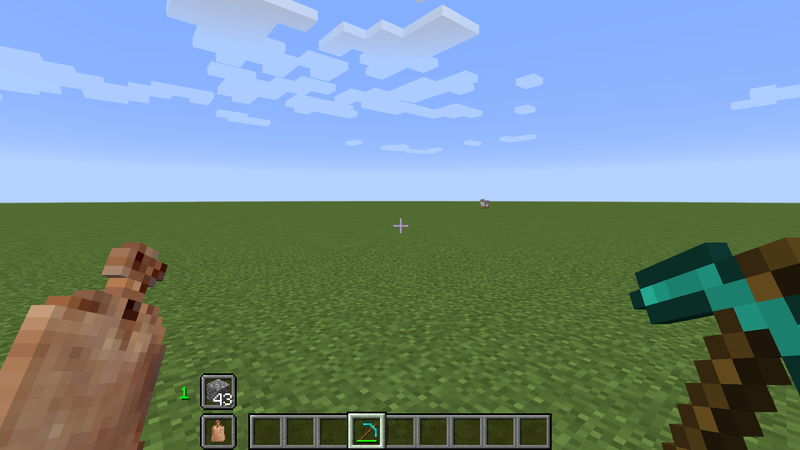 The bedrock in the overworld will be flat when this functionality is turned on. This way you can dig really far down and don't have to jump around too much to get around. By typing /home into chat you will be transported to the last bed you slept in when you are in the overworld. will be transported to where you entered the dimension. When you have a block which emits light (like a torch) in one of your hands, it will light up the area around you. This is a client-side only change so it won't affect how monsters spawn and a server admin can turn this off. For when you have that extra spring in your step. This is NOT the auto-jump feature in Minecraft. 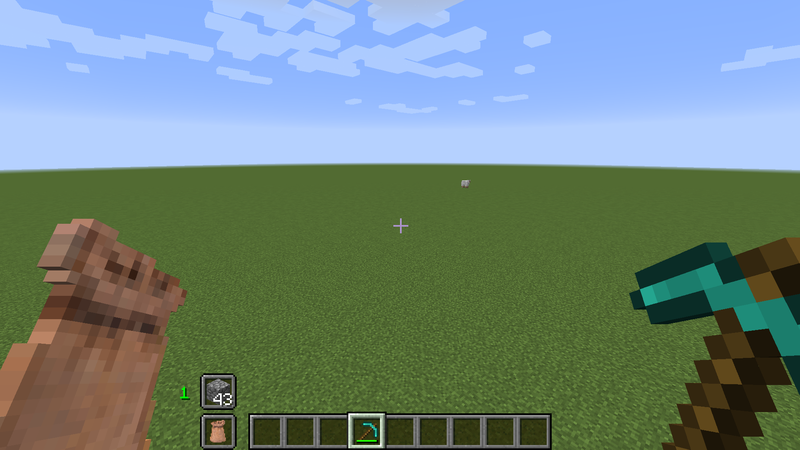 This enchantment (which has 3 different levels) allows you to move up a block automatically like a horse does. Level 1: Move up blocks up to 1 block high. Level 2: Move up blocks up to 1.5 blocks high (fences/walls). Level 3: Move up blocks up to 2. blocks high. You can use this in any mod pack, you don't need permission. I will create an issue on the issue tracker and see what I can do about it. Hello Mikeagan, I tried duplicating this with just my mod and I was not able to duplicate the issue in 1.10.2 or 1.11.2 where a Pumpkin or a Melon was growing on Enriched Farmland and a Pumpkin/Melon was spawned on top of Enriched Farmland and was turned into dirt. Maybe another mod in your modpack caused this issue? Please let me know what you find out. I will keep the Github issue open for a few days. Pumpkins on the other hand will not spawn [from the plant] on farmland (or enriched farmland) But rather will spawn on Dirt, Coarse Dirt, or Grass instead. So it's Minecraft Code that is in error and not yours. Tested with Vanilla (No Mods), Just Your Mod, and my usual mix. any chance this works in 1.11? I have been working on it. Been mostly waiting for the releases of forge to slow down (or for them to come out with a recommended build. But I could get something out tonight/tomorrow. The 1.11 version has been approved. If you find any issues please post to the Github. If you don't have a user on Github (and don't want to create one) you can PM your issue and I will create it on Github for tracking. wow this is great i wasn't expecting it that fast but thanks !! Fixed an issue on servers where it was attempting to do client-side only rendering on the client. Shouldn't the last word be 'server'? Attempting to do client side only rendering on the client shouldn't be an issue (unless the rendering is poorly done). Wow yeah. I wrote the release note pretty quickly. I will fix fix it. This has been fixed. Thanks for taking the time for reading the release note and providing feedback! In versions past mod Start home is added to the player's inventory the first time they join the world. Now test wuestUtilities-1.10.2.2 in Minecraft .1.10.2 and start home not appear. Try several times. Check config. All enables. The starting house has been moved to Prefab. This is because there are other structures that I plan on adding besides the starting house and it made sense to break that concept to it's own mod. I did add functionality into Prefab so if WuestUtilities is installed and Swift Blades are enabled the Starting House can still add the stone Swift Blade. Is there an cfg option to turn off the extra seed drop on long grass? There is not, I can add one. Will be in next update. Cool! I'm trying to put together something really well-balanced, that still forces you to go explore and get a sense of achievement, so getting those things from grass seems too easy. The configuration option was added in 1.9.4.5. Note: You will have to restart Minecraft when changing this option since this is done during Minecraft loading. I found a non-crashing bug. When you place a house a dedicated server, probably the same thing happens in ssp, the word spawn is moved to spot on the world where right clicked with the house. This eliminates the need to sleep in your bed to set your spawn for a ssp world and this thoroughly messes with the worldspawn on a multiplayer server especially when the staff have gone to great lengths to build a welcome center.